In this example 10.0.2.15 is the Hostname to use in the Rocview dialog. 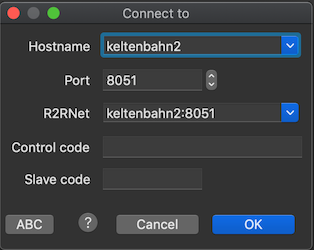 In this example 192.168.200.201 is the Hostname to use in the Rocview dialog. The standard default client service port is 8051. Check the Client Service of the Rocrail server for the correct port. Only needed if the Rocrail server has set a control code to get write access.